The Thai spiced barbecue shrimp is a terrific twist on the regular grilled shrimps and thanks to its addictive Thai flavor, you can’t ever have enough of this! My love affair with shrimps is in its peak and I am adamant to try and taste every possible recipe that can be made with shrimps! Do I sound crazy? I suppose so! 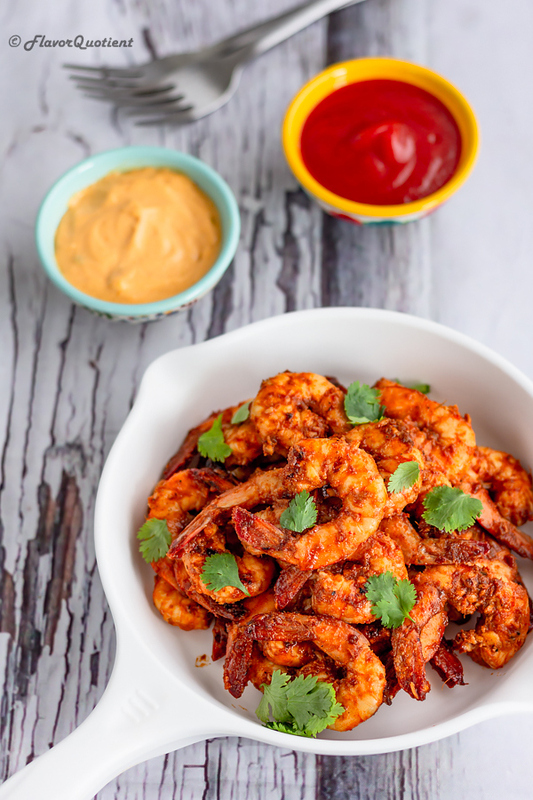 But honestly, I can’t have enough of this delicious seafood called shrimp and my never-ending inquest landed me to this recipe of Thai spiced barbecue shrimp! I can’t be more happy about it! When Thai and shrimps, both the addictive delicacies are named in the same phrase, it has to be something magical and sure it is! This Thai spiced barbecue shrimp has become my latest favorite shrimp recipe, not only because of its immense flavor but also because of the ease of its preparation. 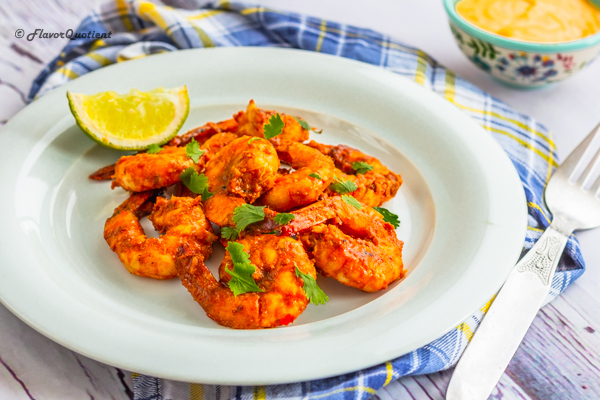 Like any other barbecue recipe, this Thai spiced barbecue shrimp also requires a good marinate and that’s all there is to it in this recipe. Few great ingredients threw in together, slapped on shrimps, marinate for an hour or so and finally fire them up on your grill! Voila! Great food served in a jiffy! This recipe of Thai spiced barbecue shrimp is a good example of how multiple flavors are balanced with each other to create that ultimate result; you will taste sweet, salty, spicy, tangy all in the same bite! Is it any less than a magic? I think not! Shrimps are great option when you want to make something good and fancy but are pressed for time as shrimps are cooked very fast. At the same time, it’s pretty easy to overcook shrimps turning them to little chewy. My advice to avoid overcooking shrimps is to cook them only until it turns opaque on both sides. Take them out from the grill and let them rest for few minutes; the remainder heat inside the shrimps will continue to cook them and you will get to eat the perfectly cooked shrimps every time. Follow these same tips while making this Thai spiced barbecue shrimp and I bet you will also be in as awe as I am after tasting this deliciousness! Thai food has very distinct flavors and I believe that’s the very reason why it is so popular across the globe. It has an addictive power to it which is why I love to keep coming back to it every now and then. Even though I have made more Chinese recipes at home till date, I still hold untouched love towards Thai food. 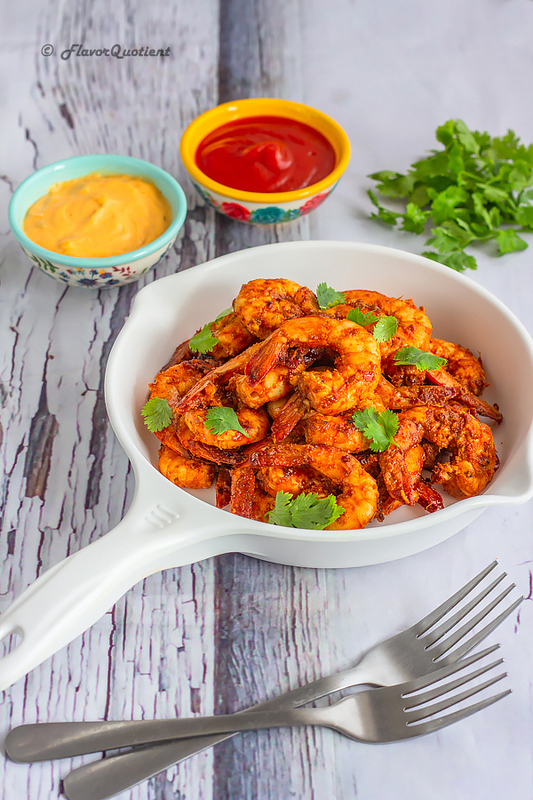 After making this Thai spiced barbecue shrimp at home, I fell in love with Thai cuisine all over again and I sincerely urge you to try making it at home and taste the best of Oriental cuisine! Shrimp lover or not, these Thai shrimps will impress one and all! That’s my guarantee! Take a bowl or resealable plastic bag and add all ingredients to it except shrimps. Mix the ingredients to create a uniform marinating mixture. Now drop in the shrimps and mix them well into the marinade so that each shrimp is coated thoroughly with the marinating liquid. Let the shrimps chill in refrigerator for 1 hour. After an hour, fire up your grill or heat a grill pan on stove top. Brush it with oil. While the grill is coming up to heat, thread the marinated shrimps onto skewers. Place the shrimp skewers on hot grill and grill them for 3 minutes each side or until they turn opaque. Baste them with remaining marinating liquid after every minute to avoid turning them dry. 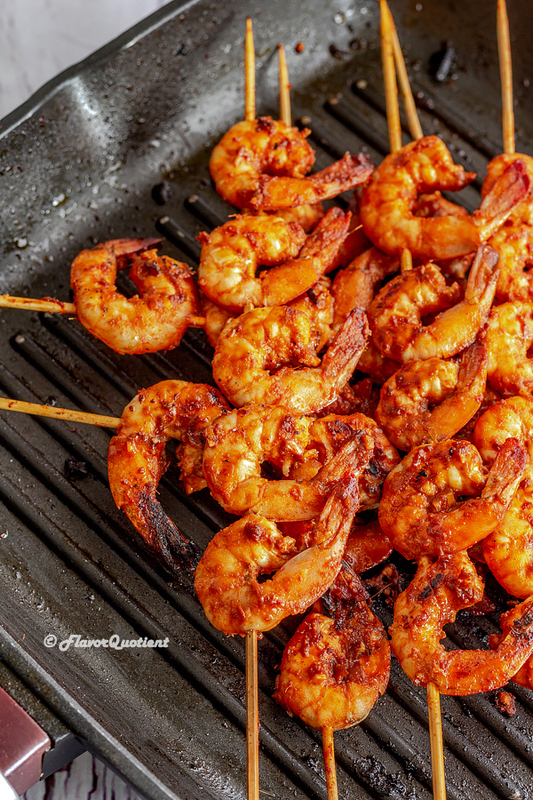 Take them out and serve the Thai spiced barbecue shrimps warm with your favorite drink. Enjoy!